I heard a seventy-eight year old man sing, through a cracked voice, one of the most moving and gentle jazz melodies, as the iconic image of a fetishised sports car being driven into the sunset were projected. And, not for the first time in recent years, I was crying at the end of a Clint Eastwood film. 'Gran Torino', like 'Million Dollar Baby', 'Flags of our Fathers' & 'Letters from Iwo Jima', 'Mystic River', 'A Perfect World', and starting with 'Unforgiven' and 'Bird' twenty years ago, is a film about a man coming to terms with death, and being confronted with the futility of violence. I'm struggling for a word here, but I'll call it the 'joy' of watching this old man working at the peak of his directorial skill - simple set ups, scripts that sound like the way people talk in real life, often lots of unknown actors filling out the cast so the show becomes less of a celebrity-spotting exercise, sparing use of music (usually written by Eastwood himself) combining to produce not only one of the most prolific bodies of work in Hollywood history, but one of the most artful. Sure, he has made some awful movies - but, as Groucho might say, haven't we all? For every 'Firefox' there's a 'High Plains Drifter' (one of the most gripping - and violent - revenge fantasies I've ever seen, and an early example of Clint's antipathy toward the church) or a 'Bird' (the second best film about jazz ever made, and maybe the best biopic); for every 'Blood Work' there's a 'Bridges of Madison County' (trust me, how many films about love between men and women actually make you believe they're in love?) or an 'A Perfect World' (a film which the Coen Brothers surely relied on for developing the Tommy Lee Jones character, world-weary sherrif, in 'No Country for Old Men'). 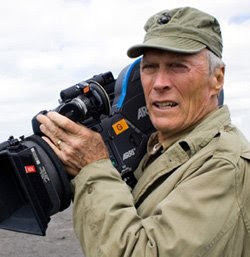 'Gran Torino' might be the last film Clint Eastwood acts in. So it's a relief - and somewhat bittersweet - for me to report that I think it may be the best performance he's ever given; or at least the best from the twilight era of his life. There are moments in this film that speak to me about my own preoccupation (some would call it an obsession) with violence and non-violence, and I find myself astonished that these ideas come from man who, when he was my age, was playing characters who shot people dead in order to get a laugh. Agreeing with the philosophy outlined in a film is not, of course, enough of a reason to think it's a great movie. And perhaps if I watch it again in a week or a year or two I'll be disappointed (even on the first viewing there are some obvious wrong notes); but for now, I'll say this. The ghost of Dirty Harry is laid to rest. The brokenness of war veterans is honoured while the powers that be, who send young men to die for politics are utterly absent. This film knows that the future of humanity depends on people being able to live together in diversity, putting up with cultural difference, and defending vulnerable members of the community. But it also knows something that the Man with No Name and Dirty Harry didn't: violence begets violence; and only non-violence is powerful enough to neutralise its opposite. How 'Gran Torino' presents the terms of conflict, or how it ultimately addresses them, may not be a textbook example of Gandhian resistance, but it's a far cry from 'Go ahead, make my day'. On the first viewing at least, it's a heartbreaking, beautiful film. If it proves to be its director's last, while I'm greedy for more, I can't thinking of a more fitting swan song.